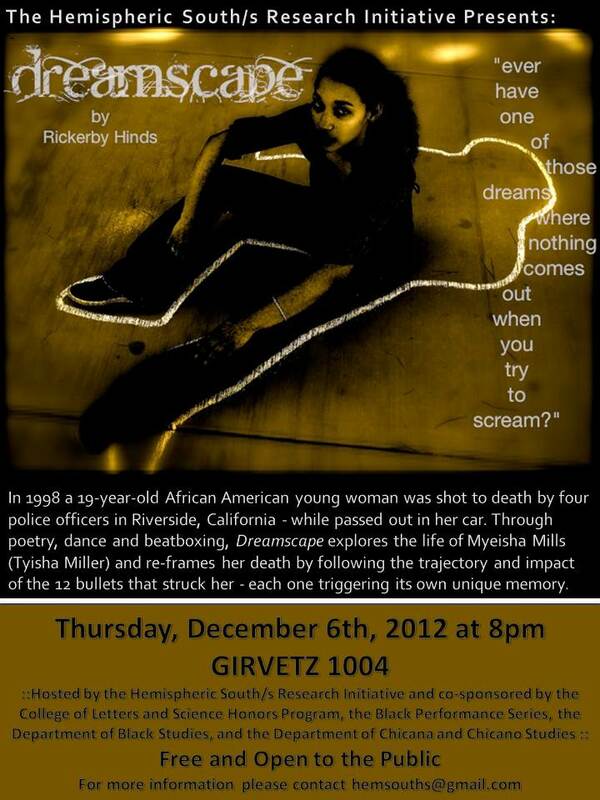 In 1998 a 19-year-old African American young woman was shot to death by four police officers in Riverside, California – while passed out in her car. 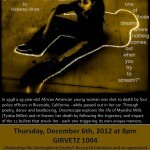 Through poetry, dance and beatboxing, Dreamscape explores the life of Myeisha Mills (Tyisha Miller) and re-frames her death by following the trajectory and impact of the 12 bullets that struck her – each one triggering its own unique memory. Read an article about the show here. Watch a short rehearsal video here. Hope to see you all there, and please do not hesitate to contact the Graduate Student Research Assistant Alison Reed (hemsouths@gmail.com) for more information!